MEAT & Livestock Australia’s new Autumn Lamb campaign has been launched this week, with a new focus on limiting food waste within an overall theme of highlighting easy preparation methods and the ‘share the lamb’ concept of bringing people together. MLA domestic market manager Graeme Yardy said with the rising trend for zero waste, the campaign will build awareness around the fear of leftovers (FOLO) to help Australians overcome leftover waste. The FOLO message will showcase simple lamb recipe solutions and tips to demonstrate ease, versatility and value add of lamb. Celebrity chef and influencer couple, Darren Robertson and Magdalena Roze, will reveal left-over lamb recipes, cooking tips and hacks in the coming weeks. 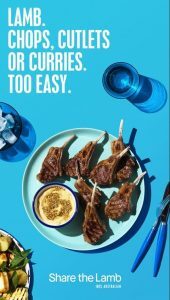 MLA said the new campaign also reinforces Australian Lamb’s ease and versatility qualities, by using the successful ‘Too easy’ campaign tagline and creative material. This highlights the many easy ways in which lamb can be cooked and enjoyed, while maintaining a consistent message as the meat that brings people together. Mr Yardy said although Australian lamb is very versatile and readily available all year around, it does suffer from a consumer perception that it is difficult to cook. “This campaign is about continuing to challenge these consumer perceptions by highlighting the many easy ways in which lambcan be cooked and enjoyed. “Australian Lamb is such a versatile meat, with many cuts that work with many flavours – and the full range of campaign activities use the product to really highlight these traits,” Mr Yardy said. Photo caption: MLA’s new Autumn Lambcampaign reinforces Australian Lamb’s ease and versatility qualities.